I received samples to try out but opinions are my own. Now that Spring is in full effect, a lot of families are having to deal with allergies. In fact, there's a whole lot pill poppin' and nose snortin' going on in my house! Did you know that every time you go outside, you bring those allergens inside the house with you? It's always a good idea to take your clothes off and be sure to never sleep in the clothes you wore so that you're not literally wrestling with allergens all night. Another great way to deal with those pesky allergens like pollen, pet dander and dust mites, is to use a product like Frebreze Allergen Reducer. It's pretty cool how it works. You spray it onto your couch or pillows (make sure the material allows it) and let it dry. It traps the allergens and forms a solid so that you can vacuum those allergens right up! 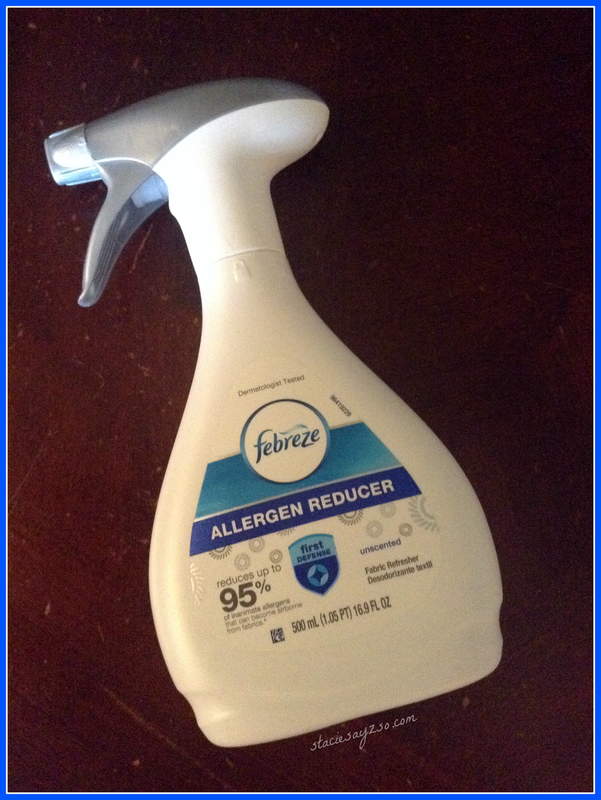 You can purchase Febreze Allergen Reducer at mass retailers, grocery, and drug stores. More info can be found at febreze.com. Febreze products make my house smell so fresh and I love the idea that can trap allergens inside my home that are lying around on my couch. This is where my family hangs out the most, so it makes a lot of sense to use this product. I have to try this since I am a HUGE Febreze anything fan! Thanks for sharing your review. I'm new to Febreze but I have to say I'm really liking it! You're welcome! I didn't realize it either until I got to try it. This is great since allergy season is in full effect. Ok we seriously need this! Thanks for the review! Stopping by from Product review moms party! I think anyone could use this in their home. Thanks for stopping by.